Lane Seminary, Hamilton County, Ohio. From Historical Collections of Ohio by Henry Howe, 1847. 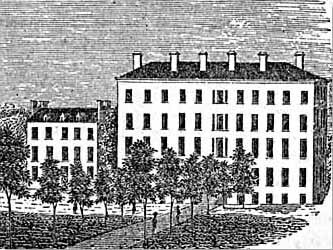 Lane Theological Seminary was founded in 1829 to educate Presbyterians into the ministry. It was named for Ebeneezer and William Lane, who pledged $4,000 to the school. The first president of the seminary was Lyman Beecher, the father of Harriet Beecher Stowe.